By common consent, China is designated “the world’s factory”. If you pick out any item from your kitchen or living room, the label “Made in China” is probably affixed to most of them. Many brands — local or international — will have their products manufactured in China. The sheer number of locally owned as well as foreign-invested factories found across the country only serves to reinforce China’s role as a major manufacturing hotspot. With an economy whose size is comparable to that of a mid-sized national economy, Guangdong province located in the south is an economic powerhouse in itself. Historically, this region was known as Canton and its key cities are located along the Pearl River Delta (PRD). Dubbed the “Silicon Valley of China”, Shenzhen is a hothouse of innovation propelling the engine of progress and development. The city is home to a rising number of high-tech companies as it continues to establish itself as a tech nirvana. Of course, any discussion of South China would be incomplete without Hong Kong, a Special Administrative Region of China. Lauded for its economic freedom, competitiveness, opportunity and ease of doing business, and its role as an international financial center, Hong Kong is a “super-connector” facilitating trade between China and the rest of the world. Not to mention that the capital of the province, the city of Guangzhou, is another critical business, logistics and production hub of the region. Part of Guangzhou’s international renown can be attributed to the famous Canton Fair, officially known as the China Import and Export Fair, which has been held since 1957. It provides a useful platform for the scouting of Chinese suppliers and a wide variety of products as well as tapping into an extensive network of import and export partners. 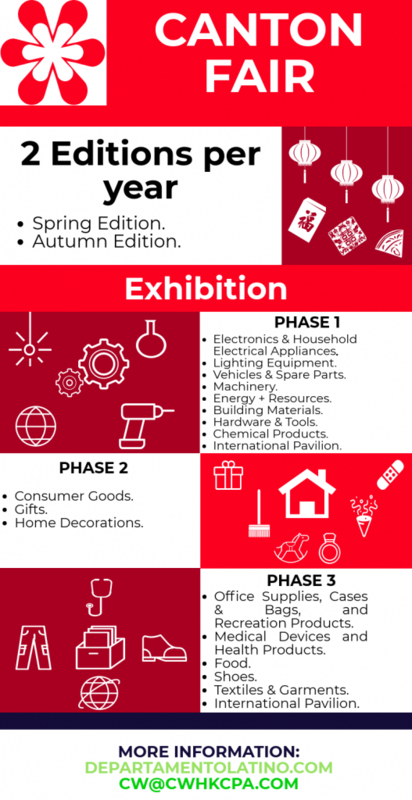 The Canton Fair takes place twice a year: once in spring between April and May and again in autumn between October and November; each fair is divided into three phases. In the first phase of the fair, goods related to machinery, electronics, hardware and tools, etc. are exhibited. There is also a section called the International Pavilion dedicated to international business delegations that come to showcase their products and services. In the second phase, consumer goods and home decorations, among other items, are exhibited. In the third phase, food, textiles and garments, clothes, shoes, health-related products and medical devices are featured alongside the second round of the International Pavilion. Exposed to the very dynamic business environment in China, many businessmen come to the realization that it is not enough to merely establish relations with Chinese suppliers; it is also important to have a presence in China to better monitor the quality of products and the process of exportation from China, for example. At this stage, it is when the idea of establishing an office or having another mode of representation in China, usually comes to mind. 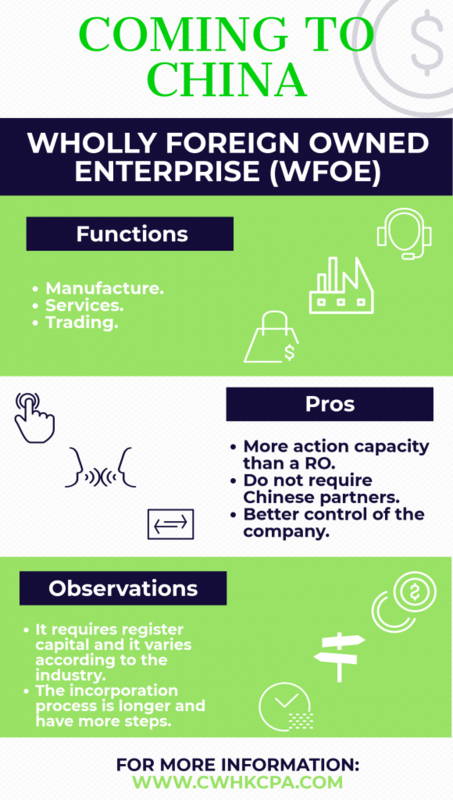 What are the benefits of establishing a company in China? Having a physical presence where an essential part of your business operations is based can sometimes help to seal a business deal, which may otherwise be hampered by the long distance, thereby increasing uncertainty and impeding effective communication between the parties. You are generally advised to physically come to China to search for local suppliers rather than doing it remotely; in this way, you can have more control over the business relationship. Furthermore, it is easier to inspect the production site and keep tabs on the suppliers to ensure that they are compliant with the stipulated standards and have the capacity and resources to meet the client’s needs. In Chinese culture, the concept of keeping “face” pervades society and plays a major role even while doing business. Having a close and amicable relationship with your suppliers can reduce the risk of business malpractices, as they would be committed to maintaining their prestige and reputation in your presence. In this sense, you can achieve a certain degree of control and pressure the supplier to comply with, for example, quality standards. Additionally, it can be deployed as a bargaining tool to drive down the prices of goods and have better negotiating leverage with your supplier. Another advantage of establishing a company in China is that you can cut down the number of intermediaries and reduce costs by dealing with the manufacturers directly. It is usual to find, in suppliers’ fairs or events, intermediaries that purport to facilitate communication between the factories and the buyers. Having an office of your own equips you with better knowledge of the business environment and allows you to conduct your in-depth research to search for genuine manufacturers. As a result of the progressive liberalization of its economy, China has created diverse entities or vehicles for foreign investment. 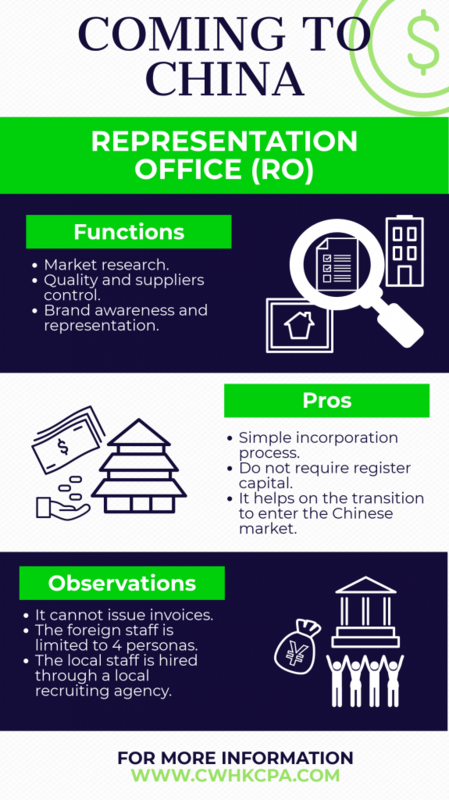 Nevertheless, the most common or popular means of having a presence in China is through setting up either a Representative Office (RO) or a Wholly Foreign Owned Enterprise (WFOE). It is important to highlight that there are specific industries in China where foreign investment is restricted under the Foreign Investment Catalogue Guidelines. Nonetheless, this publication by the Chinese government is updated every year according to its policies on national development; and market access continues to be broadened for foreign investors year after year. Having a Representative Office allows a foreign company to conduct market research and liaison activities, e.g., with its customers and suppliers. It is a relatively cost-effective way to test the waters in the Chinese market since it has no registered capital requirements or other upfront equity investment or minimum capitalization obligations. However, most types of Representative Offices are not allowed to engage in any form of profit-making activities. Since Representative Offices do not have “legal personality”, they cannot enter into any commercial contracts in their own name. Furthermore, Representative Offices can only appoint up to four foreign “representatives”, who are hired by the parent company. As for the local Chinese employees, a Representative Office must hire then indirectly through authorized employment service companies. The other popular choice is a Wholly Foreign Owned Enterprise (WFOE), which is a limited liability company under Chinese law. Unlike an RO, the WFOE can engage in profit-generating activities and issue invoices in the local currency. In contrast to Sino-foreign joint ventures, this type of entity does not require a Chinese business partner; therefore, it allows the foreign company to have more direct control over the decision-making process and the risk of intellectual property leakage is also thereby reduced. The PRC Company Law (effective from 1 March 2014) has abolished the requirement for minimum registered capital for limited liability companies. However, as a practical matter, the local registration authorities have their basic standards on the adequate capital for certain types of business activities. Registered capital is the initial investment which can be used immediately in operating the WFOE. Since China is very serious in the control of foreign exchange and the cross-border movement of money, investors should contribute enough registered capital to sustain the WFOE until it can generate revenues to sustain itself. Although guidelines and regulations have been laid down to be followed, in practice, it is always advisable to count on the professional support and knowledge of an expert. CW CPA is a professional advisory and Certified Public Accounting firm, which has more than 30 years of experience in helping foreign investors navigate the uncertain waters that doing business in China may represent. We can help you with the most time-consuming tasks, so you can focus on what matters to you the most — your core business. We are the “connector” that bridges the gap between your business and China. If you have any questions about this article or other enquires related to investment in China, please contact Marant Caballero at las@cwhkcpa.com.